Z-Wave technology is an innovative wireless communication protocol used in home automation applications. Integrating this technology, our latest Z-Wave camera can easily control and monitor all your Z-Wave devices including door-locks, curtains, lightings, power plugs, electronics and sensors. The IC731z is no longer an IP camera but also a Z-Wave controller. Our camera will allow you to add and control your Z-Wave devices and get them to work together in order to get your home to be smart and intelligent. More than an advanced IP camera, the IC731z is a complete Smart Home center that allow you to manage all of your Z-Wave devices to create the smart home that really fit you. Since your whole Smart Home Center is integrate to the camera, the IC731z itself provides everything you need from a smart home system. The IC731z is most complete all-in-one smart home solution in the market. Our Z-Wave starter kit comes with a IC731z Z-Wave Pan/Tilt IP Camera and two Z-Wave devices. This 4-in-1 sensor provides information about contact and motion detection, temperature and luminance. You can set alarm notification for each of its four detectors, and use them in the scene mode to create automation programs. The power plug included in the kit can be turned on and off remotely using our App or whenever a condition that you specified occurs. By combining these two devices and using the Scene mode, you will have your camera to turn on the power plug whenever one of the detectors of the 4-in-1 sensor are triggered. 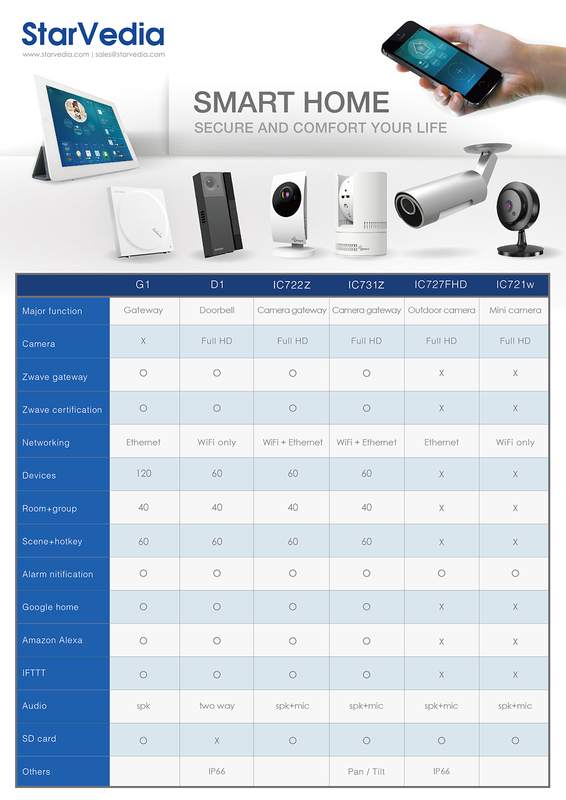 mCamViewZ+, with its intuitive design, will let you have the best usage and user experience of your IP camera, you will be able to easily configure and use all the innovative features provided by your camera. You will be able to manage and control up to 20 Z-Waves devices, create up to 10 rooms and create up to 20 scenes. You can easily alarm your house when you are out for traveling, remotely monitor your home when you are at the office or create those wonderful scenes when you arrive home or you go to sleep. Its wide Pan/Tilt viewing angle (Pan 340° and Tilt 130°). The IC731z will let you have a full control and monitoring of your house. With the Time-Lapse recording function, things that happened during days or even years in real time can be played back over just a few minutes. The camera will take frames periodically according to the time interval and the frame rate you specify and will produce a time-lapse video. This function can be applied to many situations. You can easily capture beautiful footages of subtle events such as a flower blooming, an incubation process to record a construction process. For day & night usage, the IC731z features two sensors / lens for day and night usage. The camera will sense the luminosity of the room and will switch the lens to either day or night mode. You are able to listen and monitor what is going on in your home and you can talk to the people in your house through your camera speakers. 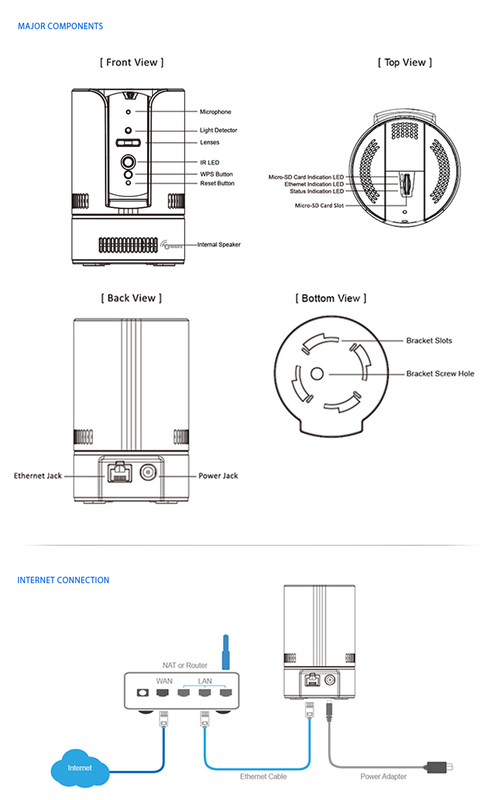 Your IP Camera features built-in speakers and a speaker jack that allows you to connect an external speaker for a higher volume. You will be notified on your mobile devices when an event (motion or sound) is detected. Even if your mobile is in sleep mode, you will be notified anywhere, anytime if something abnormal is happening in your house. You are able to playback the recorded videos on your iPhone/iPad and Android devices. Video recording triggered by events allow you to record what just happened and save it on a Micro SD card. The motion and sound detection recording has a 5 seconds prerecording, so you will never miss any critical moment. You can record the video files into any standard NAS devices or to your Dropbox account. And you can play the recorded video files remotely on your mobile devices or computers. You can set up the Wi-Fi connection of the camera by pushing the WPS button on the camera and on the router. Configuring an IP camera has never been that easy. Our Full HD IP camera is ideal to monitor your house, getting notified and playback your video recordings stored in different kind of storages. 3.3 mm, F2.8, viewing angle: 70°, fixed iris.